This long-simmering roundup covers some of my final reads of 2018 and the first ones of 2019. Some of them have already turned up in my year's best list in December, but they definitely deserve a longer consideration. In general, this is a strong list of books, even if it does remind me that with all the great books coming down the pike this year, there are so many 2018 books I still haven't gotten around to reading. 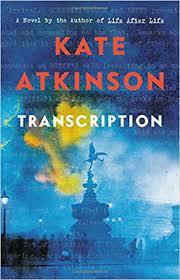 Transcription by Kate Atkinson - This was the third novel I read in 2018 with the general theme of "little-known aspects of WWII and how they utilized the work and abilities of women", following Jennifer Egan's Manhattan Beach and Michael Ondaatje's Warlight. I wasn't crazy about either of those novels, so going back for a third helping in Transcription could be seen as refusing to learn from my mistakes, but happily Atkinson's take on this concept worked a lot better for me. Like Ondaatje, her focus is on murky wartime espionage, but here with a much more precise remit: MI5's work in identifying and corralling Nazi sympathizers, in which an agent pretending to be a Gestapo operative created an entire fake operation from whole cloth in order to keep fifth columnists from seeking out the real thing. Our heroine, eighteen-year-old Juliet Armstrong, is the typist for this project, transcribing the tedious, self-important conversations recorded in the apartment next door. She's also the novel's greatest strength, observing the operation, and the antics of her peculiar MI5 superiors, with a combination of intelligence, cynicism, and naivete. Juliet is plucky and brave, but also conscious of herself as someone who is putting on a plucky and brave persona that is faintly ridiculous and drawn as much from movies as from the realities of espionage. That sardonic self-awareness informs all of her experiences, and gives the novel its semi-comedic tone, even when it's describing horrific events. When Juliet is promoted from typing duty to infiltration, in the upper class fascist group The Right Club, she's conscious of the evil these people represent, but also can't help but focus more on her exasperation when the spy antics she's expected to participate in devolve into a farce--as when the pass-phrase she's given to identify a fellow infiltrator turns out to be a common pick-up line and she almost goes home with a completely unrelated person. But Juliet is also young and inexperienced, and even as she navigates the brave new world of espionage and fascist sympathizer meetings with quick thinking and keen powers of observation, she misses a great deal that the reader will likely notice--in particular, a subplot in which she tries to shake off her pesky virginity, only to turn to exactly the wrong person for the job. What's remarkable about Transcription is how it manages to maintain this ironic, humorous tone without losing sight of the awfulness of what it's describing. There's never any suggestion that the fifth columnists Juliet spies on might actually be capable of launching a meaningful anti-government attack, but the racism and hate they express are nevertheless dismaying, precisely for coming from such ordinary, prototypically English sources. There's something rather demoralizing about the realization that the novel's heroes are coming into constant contact with genuine evil, but can't do anything substantial about it because none of it is actually illegal--a predicament that hits a little too close to home right now. This, however, is not the main thrust of the novel, which catches up to Juliet in 1950, as a producer at the BBC, who begins to fear that some of the unresolved events of her wartime work are catching up to her. These were, to my mind, the less successful parts of the novel (I suspect Atkinson fell a little too deeply in love with her research about the BBC's early days, because there's little justification in the plot for spending so much time on it), and the mystery that the novel tries to maintain until its final moments ends up being a lot less engaging than it wants to be. I enjoyed Transcription for putting me in Juliet's head, and for the tightwire act it performs when balancing between humor and horror. But not unlike the other WWII-set novels I read last year, I'm not sure it entirely figured out what it wanted to be about. Shirley Jackson: A Rather Haunted Life by Ruth Franklin - Netflix's adaptation of The Haunting of Hill House reminded me that I've had Franklin's biography of Jackson sitting on my shelf for a while, which means that for all my problems with the miniseries, it has resulted in at least one unambiguously excellent thing. Franklin's work here is fantastic, and deserves to be as heralded by genre fans as Julie Phillips's in-depth reclaiming of James Tiptree Jr. in 2006. It's an utterly engrossing read, which is particularly impressive given that Jackson lived a fairly mundane life, alternating her writing with homemaking, motherhood, and playing the faculty wife for her husband, the critic and academic Stanley Hyman. But through Franklin's descriptions, we get a sense of the vibrant, raucous social circle Jackson and Hyman built around themselves, which included some of the foremost writers, critics, and journalists of the period. We also get a strong sense of Jackson's struggles with anxiety, low self esteem (driven strongly by her casually disapproving mother), and the difficulties of her marriage with Hyman, who despite loving her deeply was nevertheless compulsively, cavalierly unfaithful, as well as being unhelpful around the house and with the couple's children, and, once Jackson became the family's prime breadwinner with her stories, novels, and essays, jealous of any writing time not directed towards paying work. In addition, A Rather Haunted Life offers a fascinating glimpse into the literary world of mid-20th century New York, which was just starting to develop into what now seems like its canonical form--things like the New Yorker fiction department (who published Jackson's "The Lottery," to a resounding public response that has become as famous as the story itself) or the great publishing houses that have shaped modern anglophone literature. Through it all, Franklin makes an argument for Jackson as a major, influential player on this scene, as well as an important literary voice. Franklin arranges her chapters by Jackson's writing projects, and by the houses and towns that she--and later, she and Hyman--lived in. Her argument is as clear as it is inarguable. Houses are a fixture in Jackson's writing, but so are homes, and the warring feelings of wanting to settle down in a place, and fearing that it could turn on you. Throughout her life, Jackson both loved and despised the small towns and suburbs she made her home in. She often used the houses she lived in as castles where she could protect herself from the outside world--which eventually took a dark turn as her anxiety intensified and she fell into debilitating agoraphobia. But it was never possible for her to completely avoid the outside world, and when she met it she often felt misunderstood and rejected, for her non-traditional lifestyle, her appearance, and simply for being a sharp observer who wrote not-very-complimentary things about those towns. A particularly hard-to-read anecdote involves Jackson learning that her younger daughter was being bullied and abused by her grade school teacher, and realizing with dismay that most of the town would side with the abuser and consider her behavior to be nothing to fuss over. This conflict, between craving home and also fearing its power over you runs through Jackson's fiction, and in Franklin's telling, through her life. Though I knew a lot of the details that Franklin reveals in this biography, I had never seen them organized as thoroughly and methodically as they are here, and the experience has given me a greater appreciation for Jackson as an artist and a person. Any fan of Jackson owes it to themselves to pick this volume up. Washington Black by Esi Edugyan - Shortlisted for last year's Booker award, Edugyan's novel is many things, but perhaps none as powerfully as a wrenching deconstruction of the coming of age trope in which a "special" child is a rescued from a horrific situation through a combination of their natural aptitude and the kindness of a powerful person. The title character, George Washington Black, known as Wash, is a young slave on a Barbados plantation in the early 19th century. Slavery is on its way out in British territories, but for Wash and his fellow slaves, emancipation can't come a moment too soon. Their lives are a litany of back-breaking labor and horrific brutalities, and when the plantation's new master steps up the latter to assert his control, Wash's protector, Big Kit, decides that committing suicide with him will be the only possible escape. Instead, Wash is drafted as the assistant to the master's brother, Titch, a naturalist and aspiring balloonist. When the boy turns out to be bright and to have a talent for drawing, Titch adopts him as his assistant, and eventually runs off with him when a calamity on the plantation puts Wash's life in danger. But the partnership, and uneasy camaraderie, between the two men is soon sundered, and Wash is left to make his way on his own. 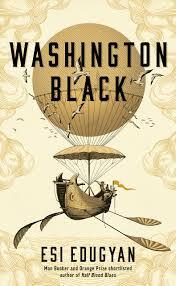 Washington Black is a bildungsroman that repeatedly questions whether the arc of such stories can really be available to a black boy like Wash in that moment in history. In his journeys among Atlantic sea merchants (who assure him they don't carry slaves but still transport the sugar and tobacco they produce), arctic explorers, the free black communities in Canada, and the naturalist circles in England, Wash constantly finds himself having to assert his humanity, not only to people who view his race as disqualifying for that trait, but to people who claim to know better but still won't allow him equal space in their world. Titch's abandonment looms large in his mind, but even more than that is the question of why the older man adopted him in the first place, thus saving Wash's life but also irreparably separating him from his community. In various scenes throughout the novel, Wash is brought up short by the reminder of the suffering he's turned his back on--a glimpse of a girl he'd had a crush on, now pregnant with the master's child; the horrible mutilation visited on Big Kit and the realization that she has found a new child to mother; a wrenching scene in which Wash, post-emancipation, sits in the offices of an abolitionist society and learns the truth about his parentage and Big Kit's fate. But his escape is never allowed to be complete, not only because his race continues to hamper him, but because even people who pity him for his suffering see him as something damaged, not entirely safe to be around. This is perhaps to make Washington Black seem unrelentingly bleak, but while there is a great deal of sorrow in this novel, it is also characterized by a joy of discovery, and a belief in the capacity of art and creation to heal and uplift even the most damaged people. For Wash, his skill as an artist offers an escape in more ways than one--it attaches Titch to him, and later draws to him the attention of a naturalist who employs him and brings him to England. But it also gives him something of his own, a reason to believe in his own worth in a world that keeps telling him he is subhuman. In his quest for a place in the world to call his own, and for an explanation for Titch's mingled kindness and indifference towards him, Wash's only salvation is to find a way to create something worthwhile, and it is the book's most profound instance of benevolence and salvation that it offers him a way to do so. Washington Black ends, not with the typical coming-of-age climax of success and acclamation, but with an extremely partial victory, and an acknowledgment that Wash will always be haunted by his past. But it also gives him enough in the world to call his own for this to be a happy ending. Milkman by Anna Burns - Burns made quite a splash last fall when she won the 2018 Booker seemingly out of nowhere. Being neither an established superstar like Richard Powers, nor a young up-and-comer like Daisy Johnson, but a mid-list, mid-career author, seemed to strike some commentators as not on. The fact that Milkman was quickly classed as "difficult" or "experimental" similarly fed into the narrative that the year's win was a little off. In fact, Milkman is dense, and not a quick read--the near-stream-of-consciousness with which the book's teenage narrator, known only as middle sister, delivers her life story, which bounces from recent to distant past, and relates even the events of the present moment through constant digressions, requires more attention from readers than more traditionally-structured novels like Transcription or Washington Black. But at its core it is telling a very straightforward story, and what's difficult about it is rather its subject matter: the violent, proscribed way of life in an paramilitary-controlled, late 70s Northern Irish neighborhood, whose codes and strictures suddenly entrap middle sister when she catches the eye of the title character, a major player in the neighborhood's unofficial leadership. 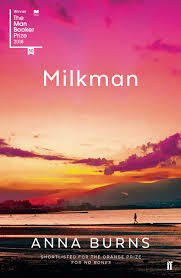 What's brilliant about Milkman--not least in the way Burns uses her run-on, seemingly unfocused narrative voice to illustrate it--is how it draws connections between the political violence that rules middle sister's life, and the sexual violence to which she suddenly finds herself completely vulnerable. The neighborhood's paramilitary leadership represents itself as a fully-functional alternative government structure, with social (and potentially violent) consequences for anyone who engages with or avails themselves of the apparatus of the state. But this leaves middle sister vulnerable to the milkman's abuse not only because he's connected, but because the things he does to her do not, in the neighborhoods' collective worldview, constitute abuse. He hounds her, destroys her peace of mind, and forces her to narrow the scope of her world in order to avoid him (early on, for example, she's forced to give up her running practice when he turns up to run alongside her, and the milkman quickly sets his sights on her evening classes and the time she spends with a boy she dubs maybe-boyfriend). But in a neighborhood where everyone is constantly aware of the potential for violence, where every family has suffered losses, and where there seems to be no hope of the future offering any better, desiring peace of mind is seen as foolish and illegitimate. The fact that middle sister sets up psychological defenses, however paltry and insufficient, against the violence and hopelessness of the neighborhood--she's known for walking with her nose in a book, and she only reads fiction from the 19th century and earlier, because she hates the 20th century--is perceived by the neighborhood's hivemind as more of an affront than the milkman's unwanted advances. It is, at one and the same time, a brilliant depiction of the psychic cost of life at the height of the Troubles, and a timeless portrait of how young women are crushed by social orders that don't perceive them as valuable and deserving of their own dignity and freedom. Perhaps because I had recently finished watching the first season of the TV adaptation, I found myself thinking of My Brilliant Friend while reading Milkman. Both works are about a smart, observant young woman who grows up in a society that fundamentally doesn't value her, and that expects both men and women to abide by codes of gendered behavior that only reinforce a violent, repressive way of life. As in My Brilliant Friend's working class Neapolitan neighborhood, the social structure in Milkman is so perfectly designed to perpetuate itself that it rarely needs to exert overt force in order to do so. The forces of conformity, communal expectations, and social pressure do the job instead, as in a running theme in the book in which middle sister repeatedly learns about couples who cheated themselves out of happiness by breaking up and marrying people they didn't love, because to be too happy in the neighborhood would single them out somehow. A crucial difference between Burns and Ferrante is that Milkman is often blackly funny, and in fact frequently switches from that tone to one of bleak fury with barely a warning. A subplot about a woman who casually poisons people, and whom the neighborhood has largely accepted as a local fixture, leads to a scatological sequence in which middle sister's mother harangues her for calling down on herself the enmity of the milkman's wife (whom she believes has poisoned her daughter) while trying to get her to purge. Other scenes involve conflicts between the neighborhood's fledgling feminist group and the paramilitary leadership in which the neighborhood's more traditional women, who exercise a limited but very real form of soft power, find themselves exasperated by both sides. None of these subplots should be funny, but in Burns's hands, the boundary between absurdist humor and outright horror becomes extremely porous, and one finds oneself having both reactions simultaneously. It's a device that ends up feeling overused, particularly towards the end of the novel, in which a subplot about middle sister's mother trying to court the neighborhood's most eligible bachelor suddenly gets far too much air. In general, Milkman overstays its welcome, particularly for such a dense read. But these are minor complaints against such a brilliant, fearless novel, one that makes for an appropriate crowning achievement for one of the most exciting Booker seasons I can remember. Friday Black by Nana Kwame Adjei-Brenyah - When you finish Adjei-Brenyah's rapturously-received debut collection and go back to look at the front cover, it's absolutely unsurprising to discover that the top blurb is by George Saunders. Saunders's influence is felt all over this book, and some of the stories are highly reminiscent of his work--"Zimmer Land" mirrors Saunders's fascination with theme parks and the people who make them work, and in both the title story and several others, there is a familiar exaggeration of American consumerism that uses fantastical elements to make its point. 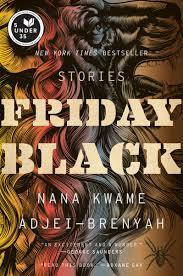 But Friday Black is also very much Adjei-Brenyah's own work, and remarkably assured and distinctive at that. The collection's opening story, "The Finkelstein 5", is a complete gut-punch of a story about life for a young black man in the weeks after the trial of the vicious murderer of five black children ends in an acquittal. It's a story that balances on the thinnest knife's edge of parody. The situation may be exaggerated, but you're never sure just how much, and the anger felt by the narrator, who also explains to us how, using clothing and demeanor, he can alter his level of Blackness (he can get it down to 1.5 on the phone, but in person the lowest he can go is 4.0), is very real. In "Zimmer Land", the park in question bills itself as an immersive experience allowing people to experience scenarios that challenge their understanding of justice. But as hinted by the title, the protagonist's job turns out to be to give white patrons a justification to play at killing a black "thug"--he even wears expanding tactical armor that suddenly makes him look bigger and more powerful, a reminder of the way that some killers of black teens have described them as possessing demonic strength and speed. Not all the stories in Friday Black are so explicitly about the current moment in the African-American experience (though all of them feature black characters, most of whom are, like Adjei-Brenyah, the children of African immigrants). In the title story, the narrator is the top salesman at a retail store on Black Friday, who has developed the preternatural skill of understanding the desires of the feral, dehumanized shoppers after being bitten by one. In "The Hospital Where" the narrator accompanies his father to the emergency room while telling us about the magical creature to whom he has sold his soul in exchange for writing talent, even as that god begins manifesting in reality and granting the narrator powers. The use of the fantastic is impressive and finally immersive--the final story in the collection, "Through the Flash", is and out-and-out science fiction piece about the inhabitants of an already-repressive future dystopia who find themselves trapped in a hellish loop in which they repeat the hours leading up to their death by nuclear explosion. In all of the stories, Adjei-Brenyah's language, powers of observation, and cutting sense of humor make for a rewarding reading experience that doesn't obscure how disquieting their only slightly out of tilt vision of the world is. I have to join in all the raves calling Friday Black our first introduction to a major new talent. 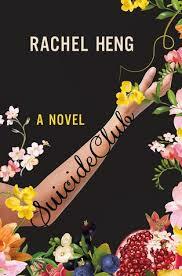 Suicide Club by Rachel Heng - When I first heard about Heng's novel, which takes place in a future in which the rich have access to rejuvenating and life-extending technologies that allow them to live for centuries and perhaps longer, I imagined it as something similar to Laurie Penny's novella Everything Belongs to the Future, in which the social impact of reserving longevity for the rich (which, to be clear, is only an exaggerated form of the situation today) is examined and challenged. So the fact that the book left me underwhelmed is probably as much my fault as Heng's, who took the story in much more character-focused directions that I found a great deal less appealing. Suicide Club's heroine is Lea, a centenarian and rising corporate star whose perfect life is shattered when she catches a glimpse of her long-missing father and gets into an accident trying to follow him. Lea's life-extending enhancements mean that being hit by a car is something she can just brush off, but the accident brings her to the attention of her society's Ministry, who monitor citizens, and especially "lifers" like Lea, for attitudes they deem antithetical to the sanctity of life. Lea is suspected of sympathies towards the titular club, whose members post videos of their gruesome suicides in protest of their society's obsession with extending life at all costs. That social obsession is Suicide Club's most interesting note. The society in the book encourages its citizens to be "life-loving", which means cutting out behavior that might endanger their health and longevity--unhealthy diets, of course; but also high-impact sports which can cause limb and tendon damage; emotionally stirring music, which can induce production of the stress hormone cortisol; any interaction or activity, in fact, that causes stress or discomfort. The problem is that Suicide Club takes this concept in a very Black Mirror-ish direction, focusing solely on the personal and rarely on the communal. Multiple scenes turn on Lea's indignation when she's subjected to invasive investigations of her lifestyle, or compelled to attend therapy meetings for those deemed suicidal. Her dizzyingly quick slide towards the socially unacceptable--all she has to do is put a foot wrong once or twice, and she's tagged as troublesome and shunted to a track that is virtually impossible to get out of--is impeccably charted, but also not very interesting. We've seen this story before (it's interesting, for example, to observe the similarities between Suicide Club and Black Mirror's "Nosedive"), and it's hard not to want to crane your neck around Lea, and get a glimpse of the wider world around her. Not that that world turns out to be particularly engaging. Stories about longevity and immortality tend to incorporate issues of climate change, overpopulation, and inequality. They are, after all, positing a world in which the rich and poor are basically separate species. But all of these elements are absent in Suicide Club. Climate change doesn't appear to be an issue, even though most of the novel's plot takes place in Manhattan, a century or so in the future. The population, we're told, is actually dropping, which neatly avoids the resource scarcity problem inherent in a class of hyper-consumers living for centuries. Most importantly, the novel has almost nothing to say about the "sub-100s", those people whose genetic potential allegedly makes them unfit for life extension technology (in fact, we never find out whether this designation, made at birth, is true or a self-fulfilling prophecy). They barely appear in the story, and their interactions with Lea and other lifer characters tend to be benign and forgettable. Even the Suicide Club itself turns out to be less a form of political protest, and more an affectation, a way for bored, dissatisfied rich people to go out in style. Again, this is me complaining that Heng hasn't written the book I wanted her to write. Her actual focus--Lea's reconnection with her non-conformist father and her growing realization that her society's way of life makes her unhappy--is well-handled and frequently quite affecting. But its gentleness was a constant reminder of the angrier novel the subject matter seemed to demand.